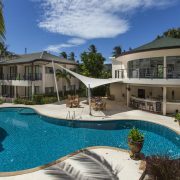 Absolute Twin Sands is a stunning resort with panoramic ocean views, contemporary apartments and first class service, all in a spectacular peninsula setting minutes from Patong on the stunning island of Phuket. Nestled between two perfect white sand beaches, the apartments and penthouses enjoy breath-taking views of the Andaman Sea. Location – Situated by the sea, this spa resort is 0.6 mi (0.9 km) from Tri Trang Beach and within 3 mi (5 km) of Patong Beach and Bangla Night Street. Banana Walk and Jungceylon XD Theater are also within 3 mi…..